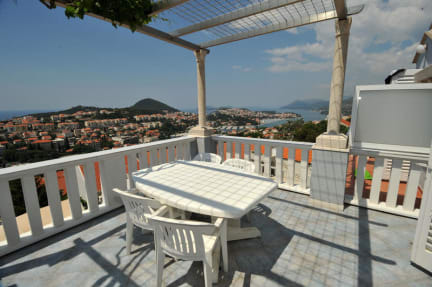 We have rooms with 2,3,4,5 or 6 beds including double rooms with balcony and magnificent view on the Elaphite Islands. Our Property also has big terraces with TV, gardens. Every apartment has a kitchen. We have free parking place, if you have a car. It is possible to have a nice time and meet interesting people from all around the world. FREE use of kitchen and many other facilities. I have really enjoyed my stay at this place and don't remember if I've ever been at any hostel that has a view like this one! When it comes to staff, Dolores was wonderful and helpful with my reservation and with booking my transfers. Then when I came I was warmly welcomed by owner (I fogot his name) and Kate, his wife. I was pleasantly surprised with juice and cookies they've prepared for me upon my arrival. Overall, it is a nice quiet place with friendly staff - I would definitely recommend! We fully enjoyed our stay at Villa banana. The view was absolutely incredible, and the stuff were so friendly and went out of their way to make us feel like home. Would definitely recommend! This hostel is so cute! The family that runs it are lovely and happy to help with anything. Not a big social atmosphere but it’s easy to talk to people in your room. The kitchen was a bit bare but that’s all, and try to organise pick-up from the bus, ferry or airport if you can because it’s on a steep hill. Would defs recommend staying here! Friendly staff, location great. Value for money was not the best because I only stayed for several hours; owners charged reg rate plus reg rate to take me to bus station. It was pure business and no genuine hospitality. Would recommend, however. View A+. Loved villa banana! The port transfer makes getting there super carefree. When we turned up they gave us crepes with bananas (as per the name) which was so nice! Dolores is really nice and very helpful! There is also a lovely view over Dubrovnik and we saw some amazing sunsets! Only downside is the location, heading into town is easy, it is 10 mins downhill... but coming uphill can be a little hard if you are with luggage. Also not ideal if you wish to party. the location is only 15mins walk from old city, and few minutes to the shop. There is free parking place and staff there are quite friendly and willing to explain everything for you. There are two toilet and shower, a kitchen but i didn't use it. The view from the balcony is really nice. Had our own room, everything was fine, hosts we're SUPER lovely and great helps, kitchen was a let down, no clean pots or pans, bathroom was average, got treats and fruit drinks on arrival, bit of a walk and up a steep hill but great views, would stay again just for the hosts! Quiet and spacious, but a bit far from Old Town. I ended up with a room to myself, which was nice, but it isn’t easy to meet others, so I moved to a more social hostel after one night. But if you are looking for space, solitude, a warm family greeting and a beautiful view, I recommend staying here.